Took the dinghy into the Gantheume Point end of Cable Beach and hitched a ride into town. Had lunch at Matso’s, a brewery, bar and restaurant. 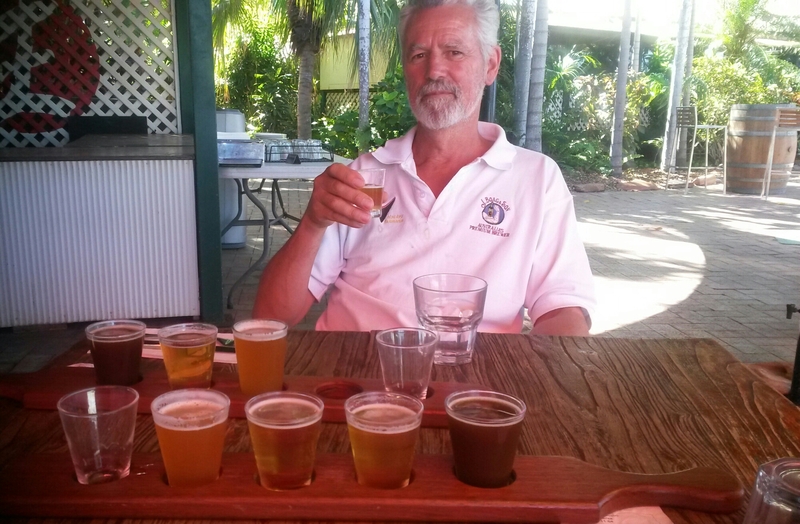 Prof was in his element with the taster paddle board of the different brews they make. After that we went to the Mangrove Hotel with a great beer garden overlooking Roebuck Bay. Then we went to the Roebuck Bay Hotel where about 30 years ago I had a memorable Sunday session. The Roey is still rough as guts but they do now have glass rather than bars in the windows. We then shopped for victuals at Coles, beer at Liquorland and got a taxi, the driver took us down onto the beach and helped us load it all into Balakerette. Broome is still very much a many faceted, multi cultured, romantic place with a character all of its own and a must visit town. This entry was posted in Darwin to Broome. Bookmark the permalink.